We are so excited to share our story, a big thank you to Jennifer Wood Media for the feature. Hampshire, IL – May 21, 2015 – Canterbury Farm, of Hampshire, IL, is a hunter/jumper training facility owned and operated by family. From its roots more than 30 years ago, the business has grown to national prestige, offering exceptional service in personalized training and care for both horse and rider. With three generations in the sport, Canterbury Farm takes pride in offering a fun, welcoming environment for riders at any level. It all began with Marcia Franklin, who grew up with a love of animals that her family’s city lifestyle never allowed. When Marcia got married and started her own family, she made animals an important part of her children’s upbringing. Marcia started riding and bought a $600 western pleasure horse. Her son Greg and daughter Joanna grew up riding and soon got their own horses to show on the local circuit. Eventually, an opportunity to buy a farm arose, and the Franklins purchased their first facility in partnership with four other families. Greg and Joanna each trained there and competed as juniors. While Greg continued to ride through college and turned professional, Joanna rode less and less. She got married and had her own children as Greg took on the family business with big plans for the future. The Franklins built a brand new facility in Hampshire, IL, in 2002. In its Hampshire location, Canterbury Farm has become a nationally renowned, full-service hunter/jumper facility. Greg is the farm’s head trainer and runs daily operations with the help of assistant trainer Caitlyn Shiels, barn manager Margo Lyons, and a team of fantastic grooms. Canterbury Farm celebrated its 30th anniversary last year and the business continues to grow. Looking back, the Franklin family reflected on how it brought them all together. Now that he is running the business, Greg has a great appreciation for everything he learned from his family growing up. His father, Jim, works a full time job in the city and spends his free days helping on the farm as well. He fixes whatever needs fixing, and although he does not ride, he fully supports his family’s interests. With Greg in charge, Marcia’s role at the farm has become less, but she is still out there four times a week enjoying the horses. Marcia continued to ride for many years until a bad fall nearly left her paralyzed. She has now taken on pony driving and enjoys buying young horses for her son to bring along. She also loves spending time in the barn with her granddaughter, as Joanna’s nine-year-old daughter Molly has taken up riding as well. 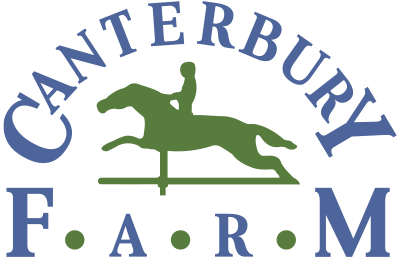 Owned by the Franklin Family, Canterbury Farm is a family-owned and operated hunter/jumper training facility based in Hampshire, IL. For more than 30 years, they have dedicated themselves to providing exceptional service to their clients by offering personalized training and care for both horse and rider. Canterbury Farm offers beginner through advanced riding lessons, and prides themselves on an environment with horses and customers are treated like family. For over 35 years, Greg Franklin has ridden hunters and jumpers to numerous championships nationally and has brought home many Zone 5 Horse of the Year awards. Franklin has qualified horses and riders for the Pennsylvania National, Washington International and the National Horse Shows including the Medal and Maclay Finals. He has also shown internationally at Spruce Meadows in the 1.40 and 1.45 divisions and is a certified trainer with USHJA. Additionally, Franklin has his ‘R’ in Hunters, Hunter Seat Equitation, and Jumpers and judges throughout the country.